If you have been waiting for the best time to purchase a manufactured home, that time is right now, during our National Christmas in October Sale! 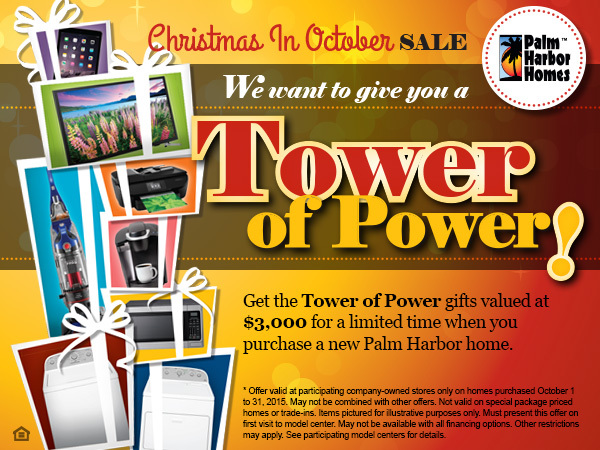 When you purchase a new home in October, you will save on many of our in stock homes and receive some wonderful gifts from our “Tower of Power” when your new home is delivered! This sale only happens in October, so find a Palm Harbor Homes location in your area and jump on your broomstick (or maybe just your car if you lack a magical flying broomstick) and fly (or drive) on over to Palm Harbor Homes. What Is the Tower of Power? Palm Harbor Homes is happy to provide our customers with this fantastic annual sale. Choose from our custom made manufactured homes or our move-in ready homes. Our homes range in size from cozy to spacious. We have a floor plan for every zombie, vampire, or human. We also offer energy efficient packages to save you money each month on your utility bills! Christmas in October is valid only at participating stores, so make sure to give your closest Palm Harbor Homes location a call to see if you can take advantage. It is almost spooky on how great of a deal this is! If you would like more information about Christmas in October, contact Palm Harbor Homes at 1-888-466-3718. We are happy to assist you in finding your perfect manufactured or modular home today!